My name is Jessica Renterghem, and I am an upcoming junior in the Skidmore College class of 2020. My current major is in Biology, with a goal of continuing my education in veterinary medicine. This summer I was accepted to intern at the PennVet Working Dog Center in Philadelphia, Pennsylvania. This national research and development center focuses on the training and strengthening of scent detection dogs – working dogs whose future careers include search and rescue, finding narcotics and explosives, or even sniffing out ovarian cancer. As an intern, I had a direct impact on the training and welfare of the dogs in this center. This summer I was assigned to a trainer, who has her own team of volunteers, interns, and dogs to train. Out of these dogs, I spent most my time training, and learning from my “focus” dog Lucy (she is the Dutch Shepherd I am posing with in the picture!). Every day in the center is busy, as each dog must be worked through a repertoire of activities designed to maximize his or her potential in their future career. Out of these, I helped with Lucy’s agility, obedience, husbandry, fit to work, scent detection training, and socialization. Each dog is taught to do agility, and sometimes with very unconventional obstacles! A live human search dog must be able to run through collapsed buildings and disaster areas, so they practice on our homemade rubble pile. This pile includes your run of the mill bricks and cement blocks, but also a full-size car and even a school bus! Though it may look like a mess, the rubble pile is built and periodically rearranged to include several “hides”; spaces that volunteers (like me) squeeze into for the dog to find. Unlike what you see in movies, search and rescue dogs do not need an article of clothing to find missing people. Instead, their noses are so powerful that they simply sniff out the person they can’t see. “Fit to work” is a special PennVet Working Dog Center program designed to strengthen a dog’s muscles, balance, and proprioception (awareness of oneself in space). It is amazing to see what a dog can do with a proper workout regimen and a little bit of imagination! I started out on the basic exercises with Lucy – asking her to put a paw on my hand, or weave around my legs in a figure eight. Once those were mastered, we raised the difficulty with half a yoga ball (called a bosu ball), balance disks and tilt tables. Husbandry involves introducing a dog to objects and stimuli that are beneficial to his or her health. We always tell our dogs what we are doing, so I say “teeth” to Lucy if I want to brush her teeth, and “nails” to put a scary nail clipper to her paws. These small exercises make taking care of the dog less stressful, especially when it involves visits from the vet. Socialization is also an important part to a dog’s development, and is typically in many different forms. Each night, the dogs go home to foster families, where they live in homes just like any other dog. In the morning, the fosters drop their dogs off “to school”, where they train for the day. This is a huge part of our dogs’ socialization, but they also get to have play dates with other dogs from the center, and go on field trips – This summer’s big trip was when I went to Hurricane Harbor with Lucy! 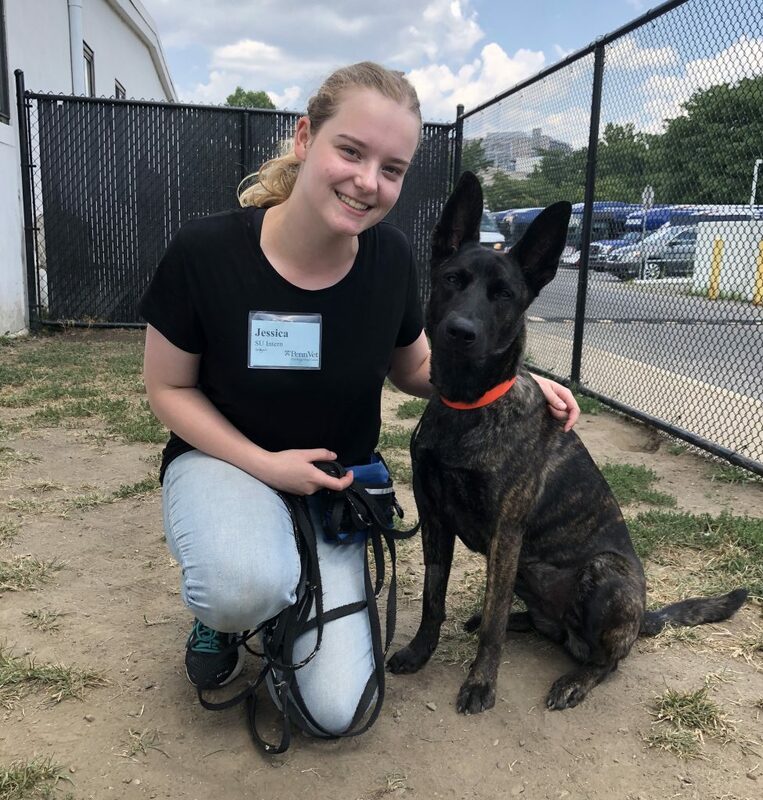 Thank you to the Summer Experience Fund for granting me this opportunity to intern with the PennVet Working Dog Center! I gained so much knowledge over the summer that I could keep going, and fill pages with what I’ve learned. There are simply no words to express the gratitude I have for this opportunity – it was truly the experience of a lifetime. This entry was posted in North America and tagged Philadelphia. Bookmark the permalink.